Varun and Anushka signed as ambassadors of Skill India Campaign! Varun Dhawan and Anushka Sharma, through their much awaited film ‘Sui Dhaaga – Made in India’ are saluting India’s entrepreneurs and skilled workforce, especially homegrown artisans, craftspeople and weavers who are making the country proud the world over. Dhawan plays a tailor named Mauji and Anushka plays his wife and embroiderer Mamta. Innocent yet ambitious, they dream big of making a name for themselves. The Sui Dhaaga stars have been signed on to promote and endorse the Skill India Mission, chaired by the Hon’ble Prime Minister Shri Narendra Modi. The film highlights the untapped potential of India’s talented craftsmen and skilled workers at the grassroot level and the challenges and issues faced by them. 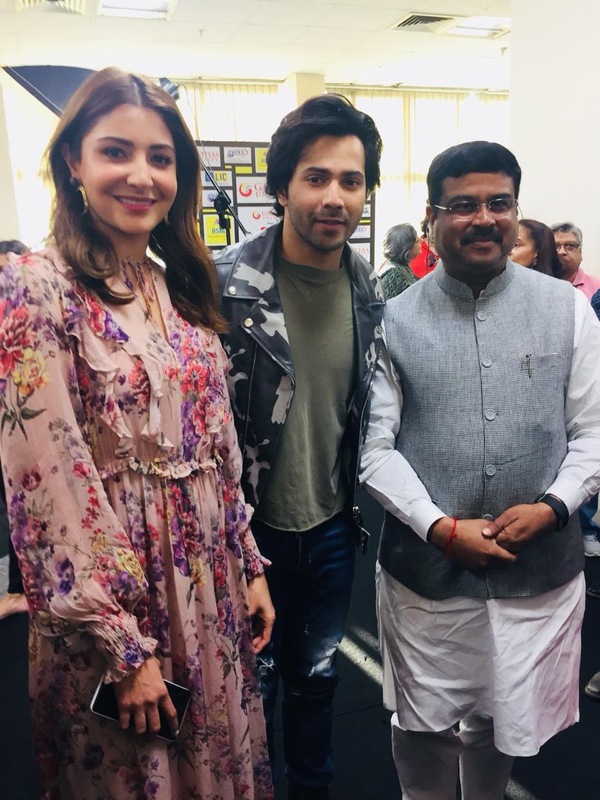 Varun and Anushka, the star cast of the film, have partnered Skill India and will dedicate time to promote India’s skilled talent and their fine work by engaging with them across different parts of the country. “I wish this endorsement by both actors encourages and influences the youth to take up skill training and earn a better livelihood for themselves and help us in creating the New India envisioned by Honorable Prime Minister Shri Narendra Modi,” he further added. Led by the Ministry of Skill Development and Entrepreneurship (MSDE), Skill India aims to standardize vocational training — both new-age and traditional skills —, helps in creation of latest infrastructure, ensures industry partnerships to extend technology support to make the youth more employable and assists in creating opportunities of employment for the youth of our country. This has led to more than 1 crore youth joining the Skill India Mission every year and transforming their lives through better livelihood. The Skill India Campaign has brought about multiple policy interventions though its Skill Development and Entrepreneurship Policy, comprehensive changes in the Apprenticeship Act of 1961 and introducing the Pradhan Mantri Kaushal Vikas Yojana (PMKVY) which together aims to provide best-in-class training to our workforce and formally recognize their skills. MSDE’s Recognition of Prior Learning (RPL) program under PMKVY recognizes the skills and experience gained through years of working, bringing about a major shift from un-organized sector to the organized sector. 16 queries in 0.686 seconds.